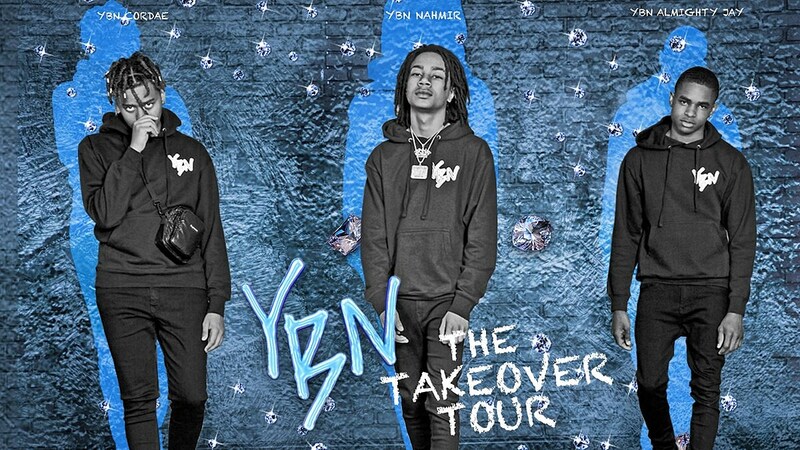 Show update: Due to recording schedule conflicts, the YBN Takeover Tour has been postponed while each member focuses on their individual projects all coming out in 2019. Refunds available at point of purchase. Please keep up to date on socials for future touring announcements. YBN Nahmir, YBN Cordae and YBN Almighty Jay released released their debut YBN crew mixtape, YBN: The Mixtape, which has a bunch of the individual rappers’ breakthrough hits and tons of other worthy material. Now, this exciting young rap crew has announced that they’ll take their show on the road with the YBN Takeover Tour. The tour starts and ends on the West Coast, and hits tons of other US cities in between, including NYC on December 12 at Irving Plaza. Tickets for that show are on various presales now (passwords = VOCALS, MUSICGEEKS), and the public on-sale begins Friday (10/5) at 10 AM. All dates are listed below. Watch YBN Cordae’s recently-released video for “Target,” and a couple slightly older videos, below.